Sanjusangen-do is a very famous temple in Kyoto, and close to it, you can find a place called Kyoto Experiences Waraku, located in a 118-year old machiya townhouse. Here you can learn about two different kinds of yuzen dyeing techniques, one with gold leaf, and you can also learn how to make earrings from Japanese paper. On the first floor, they have all kinds of crafts on sale, making the shop look like a small art museum. The second floor is where you get to learn how to make these crafts, you get to sit on a tatami mat, enjoy the wind coming in from the windows, and the calm of the surrounding temples. Just relax. They also have Taiwanese staff who can speak English and Chinese, so the instructions here are easy to understand even to absolute beginners. Do you want to have a different kind of experience in Kyoto? Then you should head to Kyoto Experiences Waraku! This over 100-year old Kyoto-style machiya townhouse is close to Sanjusangen-do Temple, and you get to sit on the tatami, and enjoy the historical feel of the house. There are many old books and things around you that just add to the feeling. On the first floor, they also have Japanese handicrafts on sale, like hair ornaments, earrings, and cellphone straps. These make for great, pretty Japanese presents. How about buying some to take home with you? You are thought by a professional on how to do yuzen-dyeing by hand. You have beautiful pieces of film and by pressing on them with a tool, you get patterns on the handkerchief. This will take some time, but I’m sure that once you get to see the finished product you’ll feel satisfied. First, vividly colored Japanese paper is folded into different shapes, like origami. Like in the picture, a small piece of Japanese paper is folded into exquisite little butterflies, which are then made into earrings. 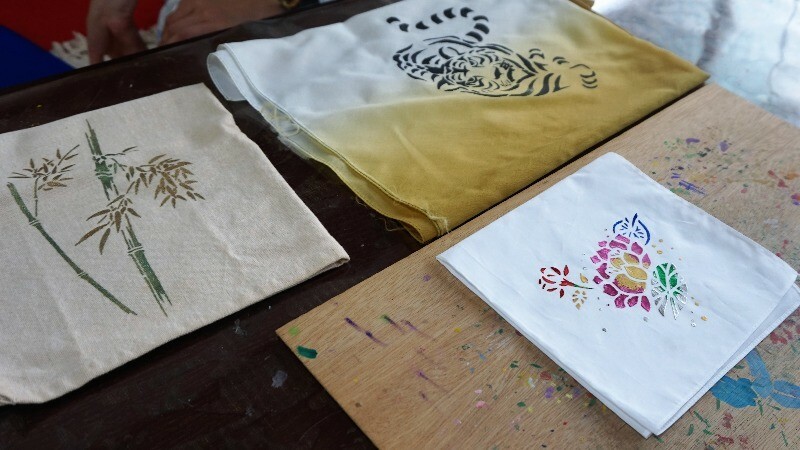 Besides their yuzen dyeing crafts, you can also choose to make a canvas bag, a “nioi bukuro“ (a scented sachet), or a cell phone strap. The machiya-style townhouse has seen a lot during its time here in Kyoto, and the historical feel of it was very interesting. It was my first time learning a style of yuzen-dyeing, and although making a handkerchief with it took an hour, but the finished one was so pretty I felt moved by it! It felt so satisfying to have the finished product in my hands. They also have staff who can speak both English and Chinese, so it’s easy to understand the instructions. This was a Kyoto-experience I’m not going to forget! How about attending a workhop of Japanese crafts in atownhouse? Especially, the techniques of Kinsai Yuzen arerarely demonstrated. The owner, Mr. Saito, and his apprentice, Ms. Liu, are both friendly and full ofhospitality and craftsmanship. Their warm personalities willease you and make you forget the time. A 10-minute walk from JR Kyoto Station or a 5-minute walk from Keihan Shichijo Station. Accepted by phone or online. Located close to Sanjusangen-do Temple and the staff can speak English and Chinese, so you shouldn’t have any worries going to Waraku.